Special Containment Procedures: SCP-887 may be kept in standard quarters. Personnel must take care he feeds himself and uses the facilities at regular intervals, as he'll frequently forget to do so (Full feeding, cleaning and exercise schedule annexed). SCP-887 must have writing materials available to him at all times, to avoid unnecessary confrontations and ensure continual research. Used paper should be sent to analysis at least biweekly. Description: SCP-887 is a man in his late forties, born in ███████, Russia. His left arm and left side of his face are partially paralyzed, resulting in slurred speech. 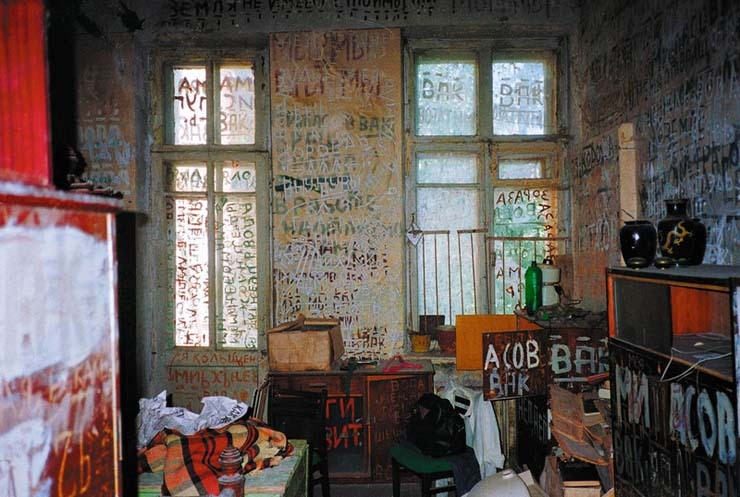 SCP-887 recently emerged from a 17-year coma in ████████ Hospital, St. Petersburg, displaying nearly-complete mental recuperation aside from extreme hypergraphia. Subject claims he was conscious during the entire length of his coma, receiving communications from an unknown source; his hypergraphia is attributed to him writing down all that was told to him during this period. SCP-887 is amiable, but has trouble keeping track of long conversations and cannot be taken off his work for more than fifteen minutes at a time. The subject is adamant about his process, going as far as writing on the walls with his own blood if writing implements are unavailable. SCP-887's output includes text, drawings, mathematical equations, and engineering blueprints. Several display knowledge of languages and concepts he was not educated in or that he would not have been aware of while interned. When questioned about the contents of his work, he claims to have forgotten or not known more than what's written down. Foreword: Interview takes place three days after subject's containment, and has been translated from the original Russian. Interviewer: Good evening. Can you understand me? SCP-887: Oh, yes, yes. <pause> You have a familiar accent, have you been to ██████? Interviewer: I fear I'm not at liberty to discuss that, sir. Now, if you please - could you state your name and place of birth? SCP-887: ████ ████████, born in… <pause> ██ of █████ … ████ … ████████, Russia. Interviewer: Do you understand why you are here? SCP-887: I… this is a hospital, yes? I believe I came for a treatment. For my headaches. I get a lot of headaches after the truck crash. Interviewer: I see. Could you describe what you remember from this accident? SCP-887: I was driving a truck - carrying a shipment of… I don't remember. I was almost to ████████, I think I fell asleep on the wheel… something hit me. I don't remember what. Interviewer: You were lying down and could not move, and then you started hearing something? SCP-887: Oh! Yes. The voices. They told me things. All the time. SCP-887: Until I wake, yes? (searches clothes again) Do you have a pencil, a pen? I need to write something I remembered. Interviewer: In a moment, sir. What did these voices tell you? Interviewer: Sir, please calm down. Interviewer: Why? What will happen if you don't write it down? A description at length of SCP-887's output that has been decoded so far is located at SCP-887 Log. Researchers are encouraged to add to it as more information is unraveled.